In 1982, the World Heritage Committee, the intergovernmental decision-making body of the World Heritage Convention, decided to inscribe the Selous Game Reserve in Tanzania on the World Heritage list. This was to honour the “Outstanding Universal Value” of this vast protected area, which is the oldest and largest (size of Switzerland) in Africa. Other such sites in Tanzania are the Serengeti, Ngorongoro and Mount Kilimanjaro. The honorary title is awarded upon proposal and request by governments and after intensive examinations and reviews by IUCN. It was a bit awkward therefore in recent years when leading Tanzanian politicians criticized the United Nations Educational, Scientific and Cultural Organization (UNESCO) for illegitimate intervention in Tanzanian affairs, after the World Heritage Committee insisted that the country’s government should follow the rules of the Convention in line with its decision to join the Convention and nominate Selous. UNESCO runs the Secretariat of the Convention and has the duty to monitor that the member states abide by their own commitments. Mining is not permitted in World Heritage properties, and the major international mining companies have entered into an agreement with the Convention not to prospect or mine there. However, many smaller or rogue companies have not signed this agreement. In the 1990s the Tanzanian Government engaged in the search for uranium in the Selous Game Reserve and finally permitted a Canadian company to develop a uranium mine in the south-western corner of the reserve. The World Heritage Convention was not amused, and finally, after an extensive critical dialogue and despite the protests of relevant players, in particular from the conservation world, a boundary modification was agreed upon during the COP in Saint Petersburg in 2012. The agreement was a deal after much muddling. Although it was a “significant” boundary modification, it was rubber-stamped as a “minor” one in order to facilitate the procedures. 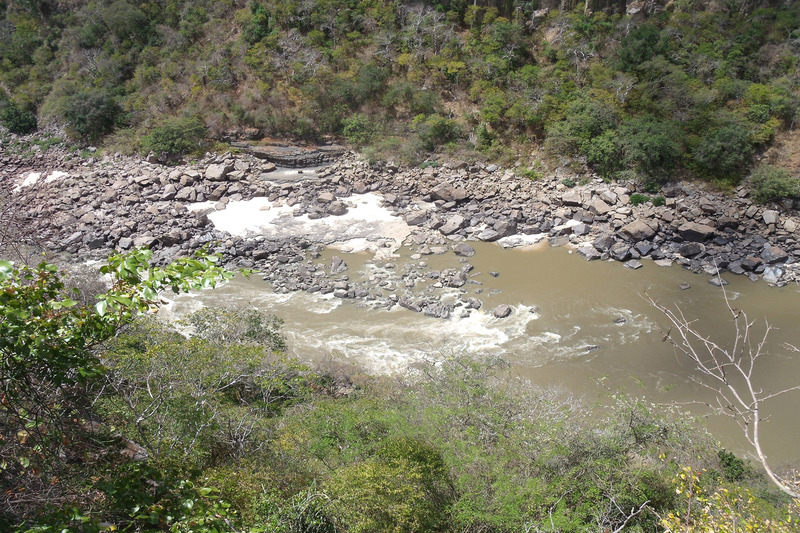 The “Mkuju River” mining area, covering over 300km2, was formally excised from the World Heritage property, but not from the reserve, as this requires a change of the respective Tanzanian law. The Mkuju River Uranium Mine and the ongoing prospecting for uranium are good examples of major environmentally destructive projects, although in principle it is against Tanzanian legislation and World Heritage rules, which a country accepts when it proposes a site for World Heritage status. The mining procedures in the Selous are interesting in relation to the Stiegler’s dam. The reader should allow me therefore an excursus. The country ranks at a score of 103 out of 180 (the worst) in the Corruption Perception Index of Transparency International. This means it is pretty corrupt, although there are still a good number of countries performing worse. This is not an exact figure, but it can serve as an indicator. Corruption always has two sides: one that pays for illegal services received, and the other one that receives money or other benefits in exchange. There are countries, some of them economically very active in Tanzania, where the payment of bribes is regarded as routine and whose Governments de facto tolerate corruption, as long as it happens outside of the country and facilitates foreign trade and investment. In most western industrial countries meanwhile, strict anti-corruption legislation exists. This does by far not mean that there is no corruption anymore. However, companies cannot pay bribes in other countries openly any more, as this would lead to legal action against them. They must hide their bribes, and this forces companies to be innovative. If “helpful payments” were made in the case of the Mkuju uranium mine or ongoing uranium prospections, the problem is therefore, how to channel payments into the country, given the strict anti-corruption legislation in Canada and the UK, where the respective mining companies were registered at that time. Some explanation is offered by an interesting contract that was leaked to members of the Tanzanian Parliament and to the press. It led to hot parliamentarian debates and a wide coverage in local newspapers. An extremely well-connected Tanzanian businessman who was a member of the central committee of the ruling party for some time and had used his connections to become the largest hunting operator in the country as well as a major player in the photo-tourist scene, signed a contract with two uranium companies for one of his hunting blocks in the Selous. The companies were prospecting for uranium in that block. The contract was drawn up by a Dar es Salaam attorney and signed by four directors of two international mining companies as well as the Tanzanian owner of the hunting company and his wife on March 23rd, 2007. A complicated, foggy 12 pages agreement boiled down to the simple fact that the hunting operator would grant the mining companies access to his hunting block to conduct mineral exploration activities. In exchange, the two companies would pay the hunting block tenant an annual sum of US$ 55,000, starting in 2007. If they would find uranium, they would pay US$ 250,000, and an additional US$ 6 million as soon as production would start. It was reported that identical agreements existed for several of his other blocks, including the one where the Mkuju uranium mine was situated. The hunting operator himself paid to the Government only annual fees of US$ 10 000 to 27 000 for the rent of each hunting block. This gave him only the right to hunt, but no additional rights in the block according to the Hunting Act and other legislation, like the Mining Act. In particular, the tenant had no right to restrict the access to and movement or activities of people in his block, if they had an authorization from the Tanzanian Government, for example to explore for minerals or extract them. The tenant was not entitled to ask for a single shilling, if a prospector with valid documents entered his hunting block. Therefore, no profit-oriented international company with a sane CEO would have paid such sums to a Tanzanian company in exchange for non-existing rights. It is therefore a realistic and logical assumption that this was just a sham contract to disguise corruption payments. The owner of the hunting company was very close to a number of political VIPs who played a role in granting exploration and mining contracts, and it seems that he served as the letterbox to receive payments on behalf of these people. The complicated contract most probably had no other meaning but covering “friendly payments”, so that the taxman and other authorities in the UK, Canada or wherever,would not find out what had really happened. ”Honi soit qui mal y pense.” Readers may correct me if they think I am interpreting the evidence inappropriately. The central rationale for the dam is electricity. Only one third of the Tanzanian population has access to electricity, in rural areas less than one fifth. More electricity is indispensable. The only question is: What is the best way to produce it? The strategic concept for the dam foresees that a private or public consortium of investors should build and run it. The state-owned Tanzania Electric Supply Company (TANESCO) would then buy the electricity. This company is at the same time the awarding authority for the construction of the dam. This model was chosen, as Tanzania itself does not possess the financial or management potential for the investment. However, a similar arrangement, which TANESCO had with a foreign private supplier in the past, led to a US$100 million loss to the state due to corrupt practices. This remains an ongoing scandal, which has not yet been disentangled. As mentioned in part II of this series of articles, the first company that was asked to construct the dam was Odebrecht from Brazil. It is Latin America’s largest construction conglomerate and has a good track record for being able to design and build functional projects. However, it was also at the centre of an immense international corruption scandal and has bribed governments all over the world in exchange for profitable contracts. Negotiations between Brazil and Tanzania were conducted at the highest level and in 2012 a Memorandum of Understanding was signed. This was renewed in 2016. The plan is to build a 130-meter-high and 800 meters long concrete-faced rock fill dam across the 8 km-long and 100 meters deep Stiegler’s gorge in the Selous Game Reserve. In addition, four saddle dams totalling 14 km will be built upstream. The reservoir would eventually store 22 million m3and cover a surface area of over 1,200 km2, which is just a bit smaller than the island of Zanzibar. The proposal foresees an installed capacity of 2,100 megawatts. 400 km transmission lines and 220 km of roads were also projected. In 2013, Odebrecht estimated investment costs for the dam of US$ 3.6 billion excluding the necessary power lines to connect with the national grid. The company provided technical planning and even gave advice on how to handle the opposition against the dam by the World Heritage Committee and conservation NGO. Meanwhile, it seems that Odebrecht is not involved any more. For some time, the Tanzanian Government had indicated that Ethiopia might fill the gap. However, on October 22nd, 2018 Egyptian newspapers reported that “Arab Contractors”, the biggest construction company of the country will build the dam. The two Presidents would jointly lay the foundation stone “in the heart of one of Africa’s largest remaining wild areas”, as the Egyptian “Daily News” naively put it. These newspaper articles have so far not been confirmed by Tanzania. Who Will Foot the Bill …? Since the planning began, the project has been in technical, economic and political turmoil. Implementation is years behind plan. A tender for construction was published but was unsuccessful. This is quite understandable, as neither the technical nor financial preconditions for the construction were met. In particular, it is hitherto totally unclear who will provide the necessary finance, which, realistically speaking, will range from an estimated US$ five to seven billion in total. For comparison: The country’s total national budget is around US$ twelve billion per year. The major donors of aid money and the World Bank have already turned away. The African Development Bank has indicated in October 2018 it might supply a credit. Most shareholders of the Bank will, however, insist that the regional institute will follow its own environmental rules. The great “inconnu” remains China. The dam might fit into their present massive African infrastructure initiative. President Magufuli has recently reiterated that the country will pay for the dam from its own resources. So far, the Ministry for Energy and Minerals has allocated approx. US$ 300 million in 2018. This was 40% of the total budget of the Ministry of Energy. It can be assumed therefore that the agreement with “Arab Constructors” is for a first construction phase only. In August 2018, the Energy Minister announced that the construction will take three years. … and is a Single Big Dam the Best Alternative? Contrary to what is normal for very big investments of this kind, the project has neither been subjected to rigid economic and technical viability studies nor have alternative options been examined. Outside observers have meanwhile expressed major concerns that Tanzania is putting all its eggs into one basket in the economically crucial electricity sector. Natural gas has been found in big quantities and is not being adequately considered. Some experts argue that a number of smaller dams might spread the risk as compared to one single large dam. The wind and solar potential has not even been looked into, although this is the approach many industrialized countries presently follow. Without sufficient data, it is unclear whether the river flow will be sufficient and continuous enough in the long run. How it will be influenced by climate change is another open question. Studies expect that rainfall will be increasingly variable and rivers will be exposed to climate-related disruptions. A combination of alternative energy production plants instead of one single mega production site would reduce risks and could altogether secure a capacity of even more than 2,100 MW, experts maintain. A decentralised production and grid system would also facilitate the provision of electricity to remote communities. All these technical and strategic questions, which will determine the viability of the project in the long run, remain unanswered. Answers would require studies and consultancies. It seems that Tanzanian experts raised their voices but were soon suppressed. The new President, John Magufuli, who was elected and took office in late 2015, has made the dam his personal project. Previously, Magufuli was Minister for Works, Transport and Communication. He sees development coming primarily through infrastructure and major investments. While his nickname “the bulldozer” indicates that he loves roads and earthworks, it also describes how he managed the institutions under him, and how he now tries to run the country. Other African Presidents built huge churches, mosques, stadiums or conference halls in order to create monuments of their Presidency for posterity. It seems that Magufuli has decided to make the Stiegler’s dam the major monument of his Presidency for future generations. All discussions and queries were ordered to be stopped. “Come rain, come sun, Stiegler’s Gorge hydroelectric dam must be constructed”, the President announced at the Dar es Salaam trade fair in July 2017 to close the debate. After the opposition had asked to be at least provided with a proper Environmental Impact Analysis (EIA), one of his Ministers announced in Parliament that critics of the project would simply go to prison. In any case, critics, conservationists and civil servants understood the government’s message. The project is not discussed openly any more. Like in any totalitarian system, nobody dares to speak up. Civil servants in particular will nowadays only talk to you about the project, if they know you well, and on the basis of confidentiality. For the Stiegler’s Gorge dam, the big danger in such a situation, in which dialogue and critical analysis is prevented by higher orders, is that erroneous developments can not be corrected, that mistakes accumulate and that the project might end in disaster. This is presently a possible perspective for the Stiegler’s Gorge dam. It could become the “White Elephant” that President Magufuli leaves behind for posterity. And what about Wildlife and the Environment? So far, we have looked into some technical and strategic risks of the project, but for many observers the most important aspects are the ecological consequences. The project is in the heartland of Africa’s oldest and largest protected area and will certainly have major negative consequences. For the President things seem to be easy and clear. In a meeting with envoys at the State House on July 30th, 2018 he was quoted in the newspapers, saying that “wildlife conservation was expected to improve after the project has been implemented.” He added that “… wildlife will get enough drinking water compared to the past.” For most Tanzanian officials, these words probably settled the environmental debate, rendering any further EIA obsolete. For others it showed complete negligence of the issues. During the Odebrecht planning period in 2013 a first scoping report for an EIA had been prepared by the local consultant “Arms on Environment”. Like all other engineering and environmental documents, it was kept secret. WWF writes in its publication “The True Cost of Power” that the report was of poor quality. In May 2018, the University Consultancy Bureau of the University of Dar es Salaam (Prof. Rafaeli Mwalyosi et al.) submitted an EIA. The document restricts itself to a few environmental consequences and leaves out the major ones. As experts comment it contains many errors, factual mistakes and gaps. In addition, the paper clearly does not any justice to the scale and the complexity of the proposed project under consideration. It identifies some negative environmental consequences of the dam, which the authors claim can be mitigated. In their eyes, the dam will pose no threat to the Outstanding Universal Value of the Reserve. They mention positive impacts of the dam on the ecosystem like an increase of biodiversity. Outside experts criticize them as unsubstantiated and highly questionable. The same applies to proposed mitigation measures, which are regarded as poorly deducted and inadequate. Even from a merely formal point of view the opus does not fulfil the legal requirements for such a project, as a so-called “strategic EIA” is foreseen in the Tanzanian legislation. According to experts and relevant international organizations, the content is of appallingly poor quality and fails to meet the most basic requirements and international standards. In particular, it is not in line with the assessment principles laid down for World Heritage Sites. It also does not provide answers to the many questions the World Heritage Committee requested the State Party to answer in both a number of written communications and in formal Committee Decisions. Relevant commentators point out that the EIA of the University Consultancy Bureau does not meet even the most basic established international standards and best practices. It does not identify the risks, impacts and benefits of the project and consequently does not facilitate the quality of decision-making that is required in the case of a World Heritage site, protected by international treaties. Many important aspects are missing, including for example hydrology, proper baseline data on flora and fauna, comprehensive social and ecosystem assessments and the biological and ecological processes, which constitute the Outstanding Universal Value of the property. Also, an accurate view of the impacts and what will be lost in the property if the dam is built, is missing. In a nutshell, this EIA does not deserve the name it carries, and its academic authors have lost all scientific credibility. In the absence of a proper EIA, the only available document on the possible impacts of the dam is the report “The True Cost of Power”, published by WWF in 2017. The WWF underlines that there “are wider impacts beyond the physical inundation of 1,200 km2of land and the construction of the dam that must be considered. There will be increased erosion, the potential dry out of the lakes that are important for wildlife tourism, reduced fertility of farmland downstream and the retreating of the Rufiji Delta and potential collapse of the fish, prawn and shrimp fisheries found there. This could negatively impact over 200,000 livelihoods…”. – reduction in ecosystem services for downstream inhabitants. The Tanzanian Government does exactly the opposite and creates facts. This is the same strategy as practiced successfully in the case of the Mkuju uranium mine. The preparation of construction is in full swing while this is written. Wide roads from Kisaki, Mtemere and Kisarawe to the site have been built. Lorries are rushing on them day and night. The drinking water system at Stiegler’s is being rehabilitated. Housing for a large working force is being constructed or rehabilitated. A Chinese construction company is present on the ground. Altogether there are already hundreds of workers on the building site. The Tanzanian Government has decided that 1,450 km2of forest shall be cleared now. This will affect approximately 2.6 million trees. Authorities expect a revenue of US$ 62 million according to press articles. It would not only be the largest single logging exercise in the world in recent times but would also constitute a significant breach of Tanzanian legislation. As an observer one can ask whether the Tanzanian Government regards itself as being above the law. A tender for logging fell through, but a Chinese logging company has been seen in the area on a recce mission some months ago. Logging has not started yet. Tanzania has to produce more electricity. The question is and must be how this can be achieved in an optimal way and with the lowest possible environmental damage. In order to answer this, all the options must be explored and compared. Instead, the Tanzanian Government is using a different logic: Tanzania needs electricity and therefore a mega hydropower dam must be built in the Selous Game Reserve. Cutting the decision-making process short bears the danger of a gigantic failed investment and can, due to its size and importance, endanger national security. There are serious doubts whether the single dam option is feasible and whether the connected risks with this dam can be managed. Somebody must advise the President that he is running in danger of marking his place in Tanzanian history as the man responsible for the country’s biggest mistaken investment. And somebody should assist Tanzania to conduct the necessary feasibility, technical and environmental studies in order to avoid this danger. The dam is situated in one of Africa’s most important protected areas, the Outstanding Universal Value of which was honoured with the prestigious and highly selective status of World Heritage Site. The negative ecological impact of the dam will be enormous. Amongst others it will probably destroy the wetlands consisting of river arms, lakes, swamps and thickets that constitute the “heart” of the reserve and its most important tourist area just downstream of the dam. A reliable and serious assessment of the impacts has not been carried out yet but is urgently required. If the Tanzanian Government continues with the project, the Conference of Parties of the World Heritage Committee will have little choice but to deprive the Selous of its world heritage status. This has happened only three times in the history of the Convention. It will lead to a major international loss of reputation for Tanzania. The national park and game reserve system of Tanzania has been one of the unique features and a unique selling point of the country internationally. As soon as the Selous loses World Heritage status, the German Government will have to decide whether it will indeed terminate its ongoing project to support the management of the Selous (Euro 18 million in 2018-2020), as it has decided and announced previously. Presently, it seems improbable that the Tanzanian Government will change its position. If it turns out in a few years that the dam cannot be finalised for whatever reasons, the damage can never be undone. There is even another hypothesis that cannot be ruled out, namely that the Government is following a plan to reduce the Selous in size and to exploit its rich natural resources unsustainably, once and forever. Members of the Tanzanian delegations to the World Heritage Conventions have indicated that the current President could indeed aim to considerably downsize the reserve. This would facilitate the logging of the Miombo hard woods valued at several hundred million US$. Virtually all the valuable timber outside the reserve was cut down during the last 25 years. It was illegally exported to China. Uranium has already been found and the prospecting continues. In May 2018, the Geological Survey of Tanzania revealed that metals like copper, silver, cobalt, zinc and gold have been discovered. “We anticipate that with technological changes, there will come a time when we can easily mine the discovered minerals “, the responsible geologist said. Several crucial buffer zones of the reserve like the Kilombero Valley Ramsar Site or the Gonabis Wildlife Management Area (JUKUMU) have already been taken over by cattle. The incursions into the Selous are on the increase and the cattle owners, might already greedily look upon the green pastures of the protected area. Many of them are big shots while the pastoralists do only the work. Even the poaching and export of ivory with a value of US$ 100 or more from the Selous in recent years might have been only the prelude to a much bigger exploitation of the reserve’s natural resources. When we published our book on the Selous “Wild Heart of Africa” in 2009, I gave some thoughts to the future of the reserve. The reserve had recovered from near-collapse in the 1980s and for years it had been under excellent management by Tanzanian wardens. Financially it had been self-sufficient, mainly due to sustainable hunting. However, dangers could be sensed already. The retention scheme had been terminated and as a consequence poaching had started again. I drew up different scenarios for the future. One was that once again the reserve would be exploited without environmental considerations. I sketched a gloomy picture in terms of poaching, mining and large projects for the years to follow. I saw such a development as a real risk, but then I wrote: “Let us be positive and believe that the Selous will continue to have a strong leadership, which will prevent such a scenario from becoming a reality.” It seems that I was wrong. The negative scenario appears looming ahead of us.